The President of the United States is throwing a tantrum. And like the tantrums of toddlers, it makes little logical sense. In a fit of pique, Trump is threatening to relocate undocumented immigrants to "sanctuary cities" as a way of punishing Democrats for not supporting his border wall and other offenses. "If the Radical Left Democrats all of a sudden don’t want the Illegal Migrants in their Sanctuary Cities (no more open arms), why should others be expected to take them into their communities?" Trump tweeted Friday. Trump's outburst shows that he misunderstands virtually every aspect of the issue. “Sanctuary cities” are places where government authorities generally don't assist in the deportation or prosecution of undocumented immigrants. But asylees are not breaking the law and cannot be deported. So sending an asylee to a “sanctuary city” doesn't change much of anything. The scheme also is based on anti-immigrant bigotry and is almost certainly illegal. The idea that transporting undocumented immigrants to "sanctuary cities" would be punishment for people who live there assumes that most of them are criminals. "Sanctuary Cities must immediately ACT to take care of the Illegal Immigrants - and this includes Gang Members, Drug Dealers, Human Traffickers, and Criminals of all shapes, sizes and kinds," Trump tweeted. But that's not true. 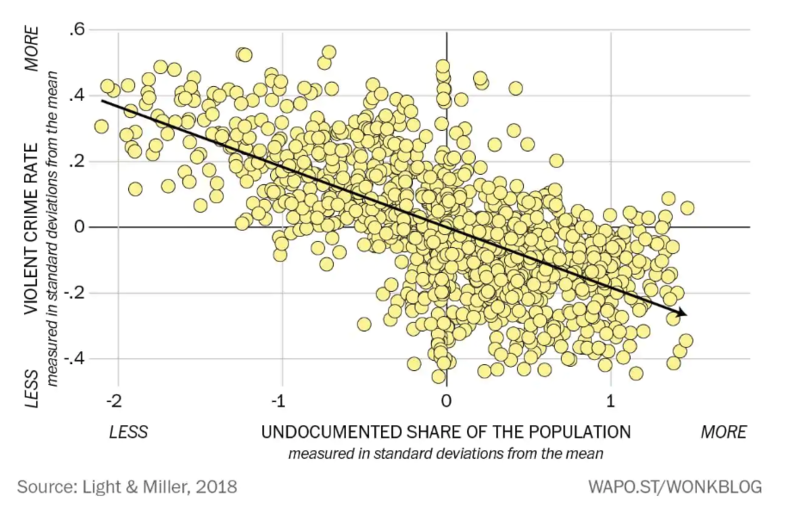 Undocumented immigrants are much less likely than citizens to be criminals. A study published by the Cato Institute in February 2018 compared the native and immigrant populations in Texas. "As a percentage of their respective populations, there were 56 percent fewer criminal convictions of illegal immigrants than of native-born Americans in Texas in 2015. The criminal conviction rate for legal immigrants was about 85 percent below the native-born rate," Alex Nowrasteh, the study's author, wrote. Another study looked across the country and found that "[i]ncreases in the undocumented immigrant population within states are associated with significant decreases in the prevalence of violence." The irony of Trump's threat is that, if he ever sent undocumented immigrants to “sanctuary cities,” it could make those communities safer. Cities across the country, while condemning Trump's rhetoric, have publicly said they would be happy to accept more undocumented immigrants. I am proud that Cambridge is a sanctuary city. ... Trump is a schoolyard bully who tries to intimidate and threaten people. I’m not intimidated and if asylum seekers find their way to Cambridge, we’ll welcome them. As a welcoming city, we would welcome these migrants with open arms, just as we welcomed Syrian refugees, just as we welcomed Puerto Ricans displaced by Hurricane Maria and just as we welcome Rohingya refugees fleeing genocide in Myanmar. The city would be prepared to welcome these immigrants just as we have embraced our immigrant communities for decades. Trump's plan could benefit many migrants, putting them in places where there is more support. "Many of these locations have more resources to help immigrants make their legal cases to stay in the United States than smaller cities, with some of the nation's biggest immigration advocacy groups based in places like San Francisco, New York City and Chicago," the AP reports. In addition to being bigoted, the proposal being floated by Trump is likely illegal. The administration can only spend money on things when Congress has appropriated funds. Of course, there are no funds appropriated for the Immigration and Customs Enforcement (ICE) to inflict retribution on Trump's political opponents. So ICE would need to come up with a pretext to justify the expenditure. When the idea was first floated last November, ICE officials said there was no legitimate way to do so. "Not sure how paying to transport aliens to another location to release them — when they can be released on the spot — is a justified expenditure," Matthew Albence, acting deputy director of ICE, wrote. When the New York Times reported that Trump’s top aides had pushed a proposal to ship undocumented immigrants to “sanctuary cities,” Trump derided the report as fake news. But less than an hour later, Trump himself was pushing the same proposal. On Sunday, White House Press Secretary Sarah Sanders said Trump supports the idea, and the administration is working to make it happen. The president heard the idea. He likes it. So we are looking to see if there are options that make it possible and doing a full, thorough and extensive review. The president likes the idea and Democrats have said they want these individuals into their communities. So let's see if it works, and everyone gets a win out of it. "[Democrats] can either deal with it at the border and stop it from getting worse, or they are going to have to take on some of that burden in their communities," Sanders concluded. According to the Washington Post, the “sanctuary city” proposal is the brainchild of White House adviser Stephen Miller, who is rapidly consolidating control of immigration policy in the Trump administration. Miller is, perhaps, the nation's most powerful internet troll. He once ran for student body president championing the idea that students shouldn't have to pick up trash because that was a job for janitors. The purpose of Miller's sanctuary city proposal is not to create substantive change but to bait Democrats into opposing the idea. Democratic opposition would be "proof" of their hypocrisy because it would reveal they don't want undocumented immigrants in their community. It's childish and pointless but it is also the kind of thinking that is ascendant in the Trump White House. Senator Rick Scott (R-FL) acknowledged Trump was trolling Democrats, saying that the purpose of the proposal is to "make everyone crazy." Jay Inslee, the Governor of Washington State, who is also a candidate for president, didn't take the bait. "You can't threaten somebody with something they're not afraid of. And we are not afraid of diversity in the state of Washington," Inslee said.